The Versatility and Value of Modular. At River Valley Builders, we’ve seen a shift in what many new homeowners need and want. Thanks to our diverse floorplan offerings and ability to customize every step of the way, we are able to deliver precisely what our customers look for in a new home. In fact, we have seen more and more younger individuals and couples seek out smaller, more modest designs. One great floorplan is Independence III. It is a single story home with three bedrooms and one bathroom. The 955 square foot has everything a small family would want! 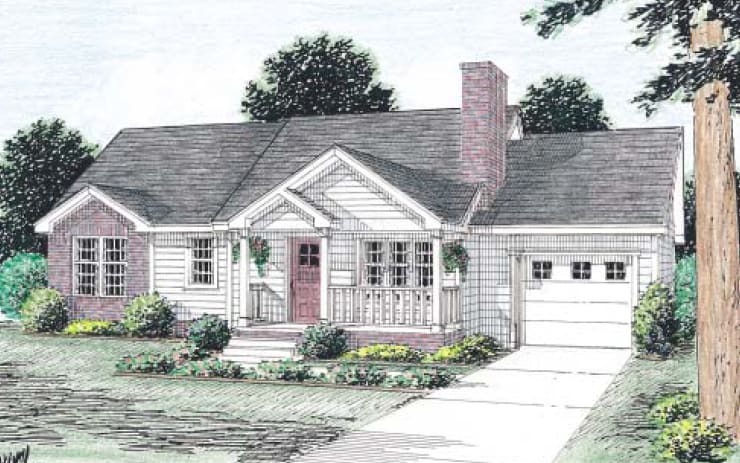 This home features a covered porch, a fireplace, and a garage. This home is a perfect example of a more modest design that still includes many luxuries. Another home with a more modest design is Barclay. Barclay is a beautiful and simplistic home. This 1,315 square foot home offers maximum convenience with three bedrooms and three bathrooms. This home also has a small front porch and a fireplace. Though it may be compact, it is extremely efficient. These more modest designs typically offer the same amenities that some of our larger floor plans offer, just a little more compact. Younger generations are becoming more and more inclined to reduce their carbon footprint, which is why a modular home is already a great option. However, choosing a more compact design requires less building materials, less space to heat and cool, and uses less electricity. If you are interested in learning more benefits of choosing a modular home, check out our blog post The Benefits of Choosing a Modular Home. We offer various different floorplans ranging from more modest to more elaborate designs. No matter what size home you are searching floor, our team at River Valley Builders is here to design your dream home! Contact us today to get started!